DIAGNOSTIC FEATURES: 2 to 4 tiers of cups, each arising from the center of one below; smoothly corticate podetial surface; NIS. If cups are single, there is almost invariably a tiny peak in the center of the cup as though a stalk was beginning to grow; compare with C. pyxidata complex, all with soredia. 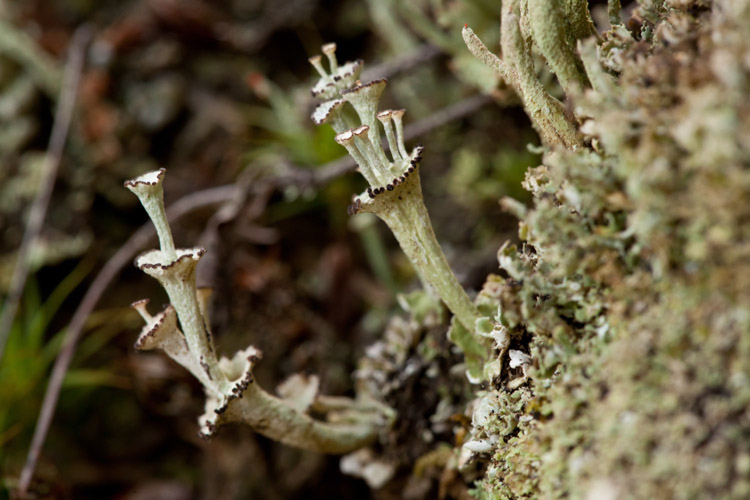 ECOLOGY: This lichen is widely distributed in the northern US; common throughout Ohio, on soil almost exclusively, an “old field” species, also common in unreclaimed stripmines.